I’m sharing an easy chili recipe today that is made in the crockpot. This meal is gluten-free and paleo because I made it bean-free for those of us who are sensitive to legumes. This is a hearty and delicious recipe full of vegetables, texture, and flavor! I’ve been playing around with batch cooking lately, where I essentially make 2-3 dishes on the same day, and then freeze or pre-portion them out for the future. 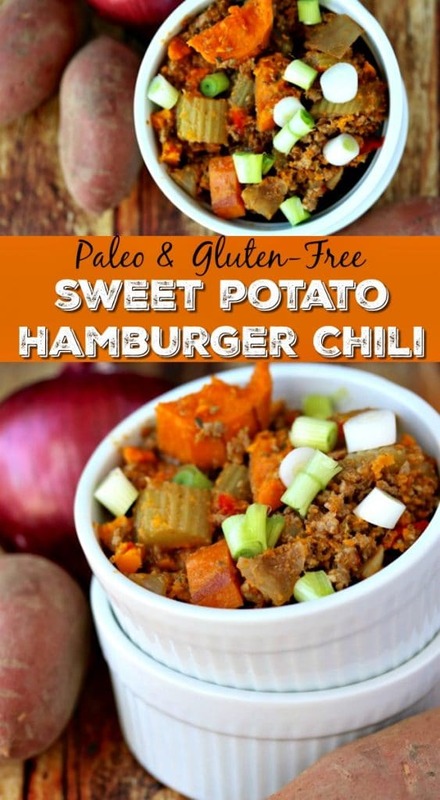 This Sweet Potato Hamburger Chili is one of the recipes I used for that experiment, so I ended up doubling it to make about 8 servings total. I’m glad I did, because I really loved how it turned out. 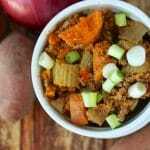 The ingredients are really simple, too, including sweet potatoes, onions, bell pepper, celery, tomato sauce, grass-fed ground beef, and spices. A sprinkle of freshly-chopped green onion adds freshness when serving. I can’t say that this is a one-pot meal because I cooked the vegetables in the crockpot, and then cooked the ground beef on the stovetop right before serving. But, it really is an easy recipe to prepare, with minimal clean-up. We’re pretty quickly moving away from really cold weather now that spring is upon us, but I always prefer a hot meal for dinner, even when it’s warmer outside. To re-heat the leftovers, I would suggest transferring to the stovetop, or you can even use the microwave. This chili recipe is made legume-free, but with the delicious and hearty ingredients of sweet potato, vegetables, and ground beef. Make a double batch to enjoy the rest of the cold weather season. 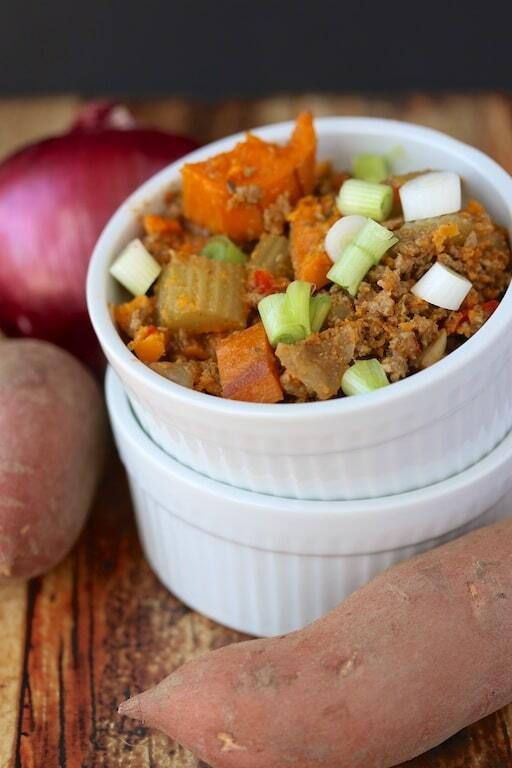 Place the chopped sweet potatoes, onion, red bell pepper, and celery into the base of a medium-sized crockpot. Pour the tomato sauce over the top of the vegetables, along with the oregano and salt and pepper. Place the lid on the crockpot and cook on high for 3-4 hours, or on low for 5-6 hours. The vegetables should be soft and the sweet potatoes should be cooked through. Just before serving, you’ll need to cook the meat to add to the vegetables. Heat a large non-stick skillet on the stovetop. Add the ground meat and use a spatula to break it up. Cook for about 5 minutes or until the meat is cooked through. Transfer the cooked meat to a paper towel-lined plate to absorb any excess grease. Then, carefully add the meat to the crockpot and stir to combine. Serve the chili with about a tablespoon of chopped green onions per person. Refrigerate or freeze any leftovers and re-heat on the stovetop. Join my weekly newsletter list to get all the latest news and recipe links delivered directly to your inbox. This saves you time so you don’t have to keep checking my site for new posts. Right, Allison!? I love anything with ground meat and described as a hamburger. 🙂 Have a great week. XO. I can’t eat beans anymore so I really appreciate this bean-less chili! Thank you! Love that sweet potato in there! Thanks, Renee! I’m loving this bean-free meal, too. XO. sounds great! I know my kids would probably like it a lot better with potatoes too. Yum! The sweet potato in there sounds delicious! 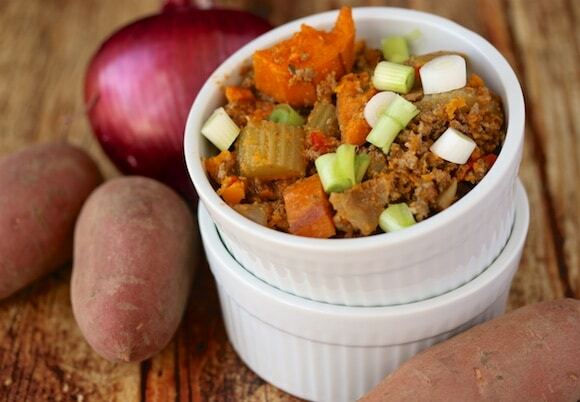 Sweet potato in beef chili sounds divine! Yum.. I love sweet potatoes and I love chili. Guess I know what I’m making for dinner. This looks like such a hearty recipe I love it Carrie! I bet the sweet potatoes add a lovely, creamy, hearty texture to this yummy chili. SO yummy with those topping too! Love this recipe. What a lovely everyday comfort food ! Busy Mamas have to batch cook if you want to eat real food, great idea for a lovely recipe. My mom used to make hamburger chili all the time! this looks amazing! 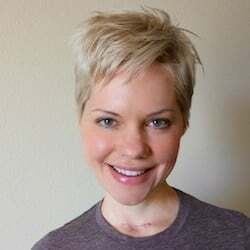 Thanks, Dana! Enjoy the rest of your weekend. XO. I LOVE sweet potatoes in chili! Can’t wait to try this recipe out! So many great flavors in this dish, yummy!!! I love sweet potatoes in chili! I love sweet potatos so I surprised that I never thought to do this! Looks amazing!